In October, I lost my longtime companion and beloved kitty, Lotke. I went to Austin Pets Alive and got a four-year-old black kitty, Bella, to join my household. 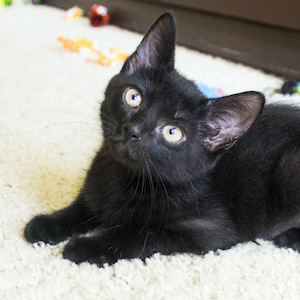 As black cats are chosen least often, they tend to languish in Austin’s no-kill rescue centers. It’s sad, especially since I find them to be really sweet kitties. Of course, when one brings home a mature cat that has been caged, with strangers staring at them day after day (no offense to those who take care of those cats), they can have emotional issues. And that’s without including whatever happened prior to the pound. It could be they were tossed on the street when they are kittens, or their “caretaker” left them when they moved, or Mama or Daddy died. Bella has been no exception. When she arrived, Bella began pacing. She would go around and around the living room. Sometimes, she went through the living room into my office and out the other side. It concerned me. No telling what was going on to create this behavior. But I didn’t have to know in order to assist her. I tapped her pacing away, and with it, some of her angst. Hally, my other kitty, is bigger and has been considerably less than welcoming. One expects a month or so of feline hissing at a new arrival, but Hally’s nastiness was too long-lived. I resented her uncivil behavior toward little Bella. What could I do other than clearing them both? In retrospect, I should have started clearing them the day I brought Bella home. After all, clearing people and animals is what I do. Rest assured, your pet has anxieties, fears, and bad dreams, just like you do. Their reasoning may not be the same as yours, but they still can be unhappy, even in a loving home. Perhaps they’ve had a bad early experience before you got them. Perhaps they’ve got issues with other animals in the house. Perhaps their food is giving them allergies, and they feel bad. It’s interesting assuming the essence of a cat or dog when working to clear them. Sometimes, I get flashes of their previous background, which can be useful information. Sometimes I don’t. I do as much clearing at a setting as I think they can take, and then get out of their energy field to let them process. Cats are extremely sensitive to energy. Dogs tend to respond quicker than cats to the work. Cats can be a challenge. But if they live in our homes, they understand a lot more than we ever give them credit. They often try to tell us their needs, and often, we just don’t listen their body language. So what happens is their “language” gets louder with poor behavior. Bella’s new message is manifesting as licking her fur off. At first, she had a perfect one-inch circle around her front legs with missing hair. That came, I believe, from needles stuck in her legs as she was being treated for a lung infection (grief) when I got her. But then, I noticed a bare spot at the base of her tail. Later, the hair began to disappear in patches from her hind legs. What could it be? Is Hally mistreating her when I leave home? Does Bella have a food allergy? Is her past haunting her? Time to find out. I discovered through muscle testing that Bella’s fur loss was due to anxiety regarding Hally’s dominance. Bella was licking it off. She got worse before she got better. After a few weeks of licking, Bella was looking raggedy. I had to do tapping for her. Next, I go through the points: Who does she think she is? Why can’t I be the only cat in this house? She doesn’t belong here. I resent her. She’s a nuisance. Etc. I do one or two rounds. Then I do a positive round: I don’t like it, but Mom wants her here. I don’t have to let her touch me. Looks like she’s here to stay. I can live with this. I’m above all of this. I can be patient. Etc. Very important! When I am done, I take time to now say, “I am Robin” three times. Don’t want to be licking my fur!